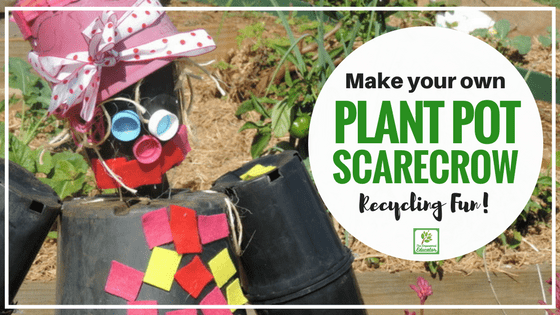 As both a parent and educator I love finding ways to plan and create children’s recycling projects and our plant pot scarecrow was a whole lot of fun to work on together! 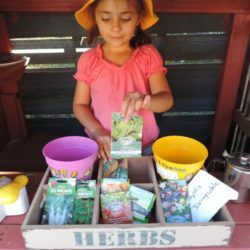 We never throw out empty plant pots here because they get reused for so many things – to plant new seeds, in the sandpit, for water play, to paint, to build and stack with, to transport rocks around the yard and so much more. 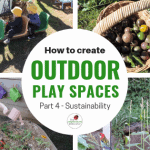 They are a wonderful resource to use over and over in the backyard or outdoor play environment. We recently went through the collection (it might have been a bit bigger than I initially thought…I put my hand up to hoarding loose parts for play!) and sorted by colour and size. 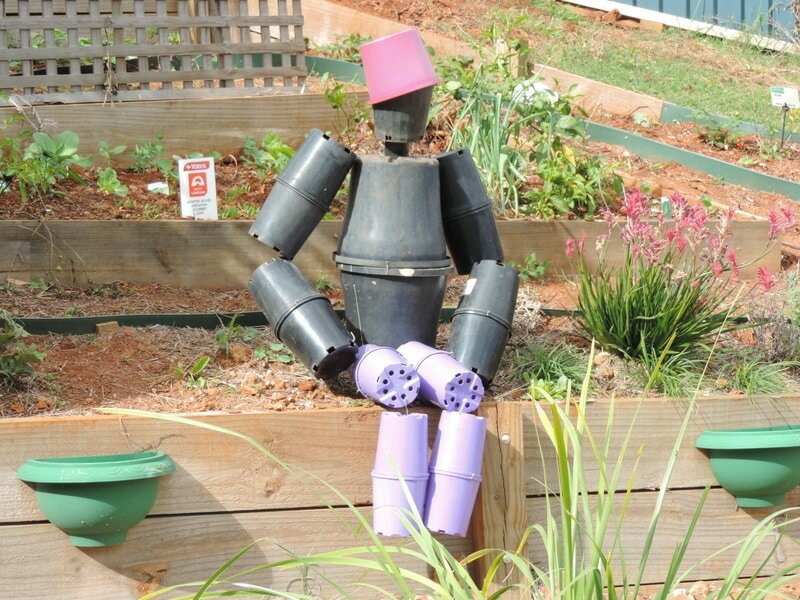 My twins asked if they could make a scarecrow for the vegetable garden and their clever Dad decided we could create one using some of the ever expanding pot collection they were sorting. So operation Pot Man began and I’ve shared how we put ours together so you can give it a try to! 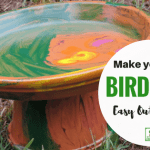 It is an easy project to do with a group of children or just a few. 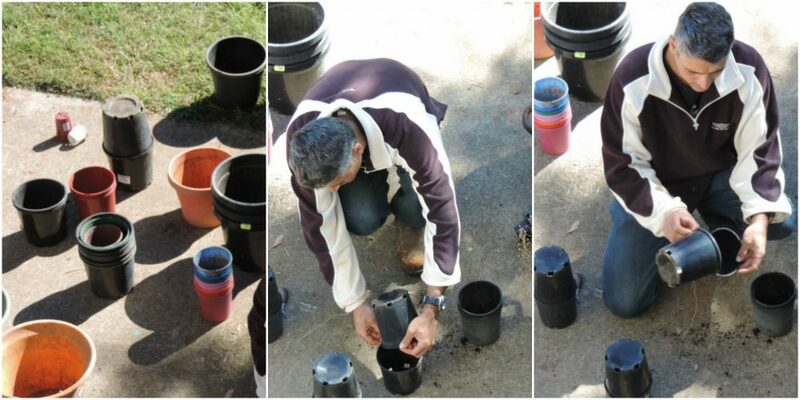 The girls continued to help sort the pots into sizes and then clever Dad began matching sizes and laying out his design on the ground first. He then used thin wire to tie pots together through the holes in the bottom – matching the open rims end to end. The request for ‘purple pot legs’ was made (you don’t hear that everyday do you?) so we collected matching purple pots and they become the moveable legs. 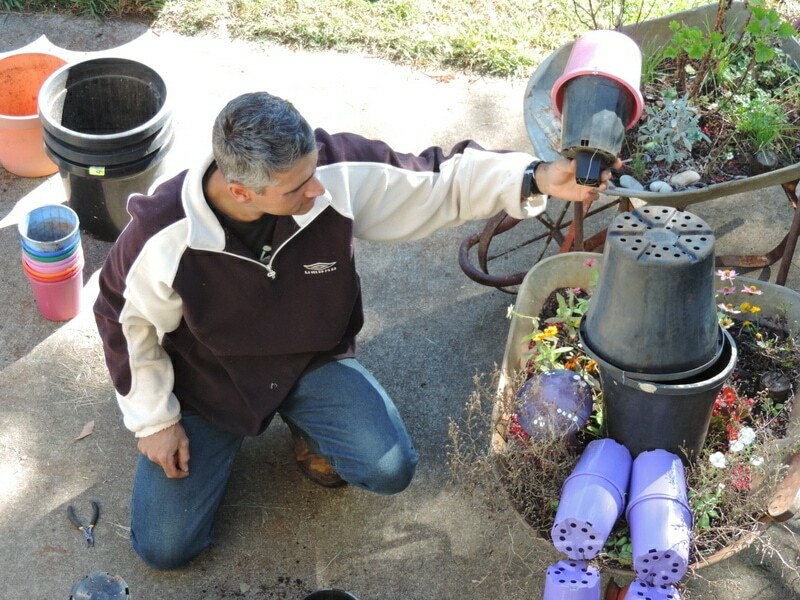 There are no specific step by step directions to follow as it depends on the pot sizes you have and how big you want to make your pot scarecrow.But as you can see the larger pots were wired together to make the body, smaller for arms and legs. The important step is to make sure you have matching sizes so they wire together easily. 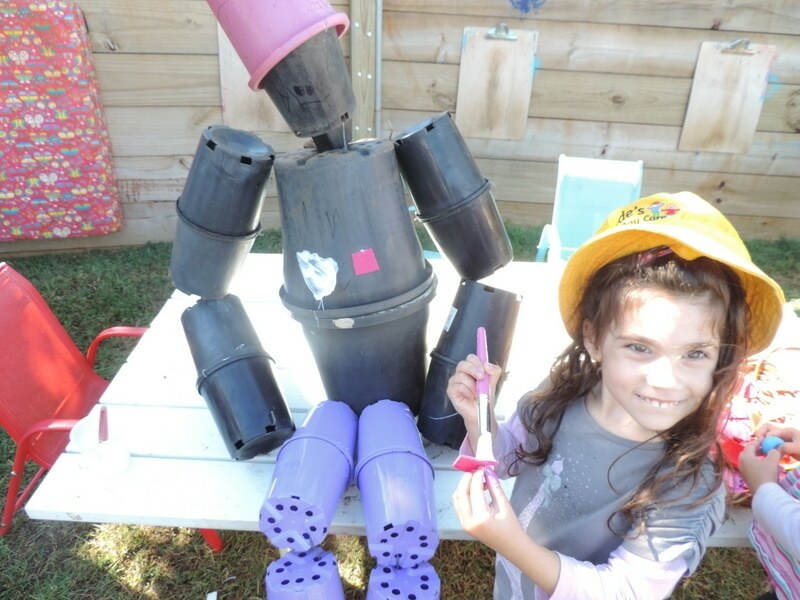 Once you have the pots assembled the way you want them to form your scarecrow it’s time for the children to get creative and make him their own! He’ll be sitting on the fence in our children’s vegetable garden here when finished. They really enjoyed having total creative control and there was lots of conversation about names, where he could go and what parts of the body to decorate. I also took the opportunity to talk more about recycling and upcycling materials that we often just throw away and we brainstormed other things we could try doing with the pots to extend the learning . 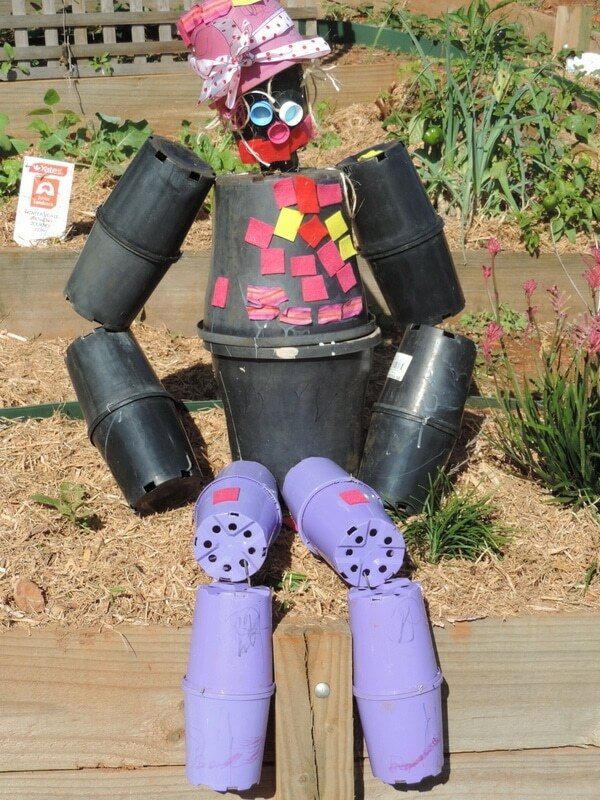 Our Pot Man Scarecrow really brightened up the yard and he became a creative focus for a few weeks as the children decided they wanted to keep adding touches each day. I provided materials and they went to work – lots of collaboration, conversations, problem solving and big muscle play as they moved him around the yard. 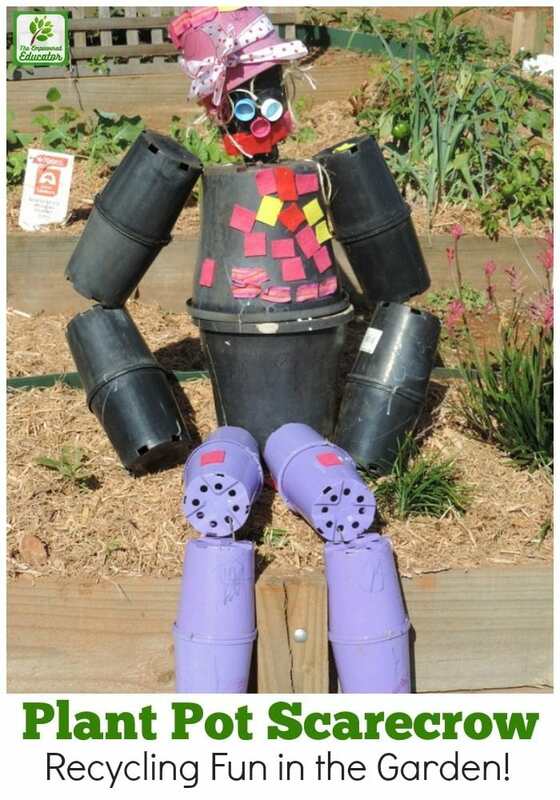 Why not create your own version of a pot man scarecrow with the children? They could contribute different pots then work together as a group to build and decorate. 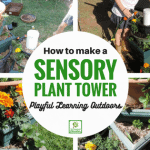 Depending on the ages of the children you could make easier or more challenging versions. 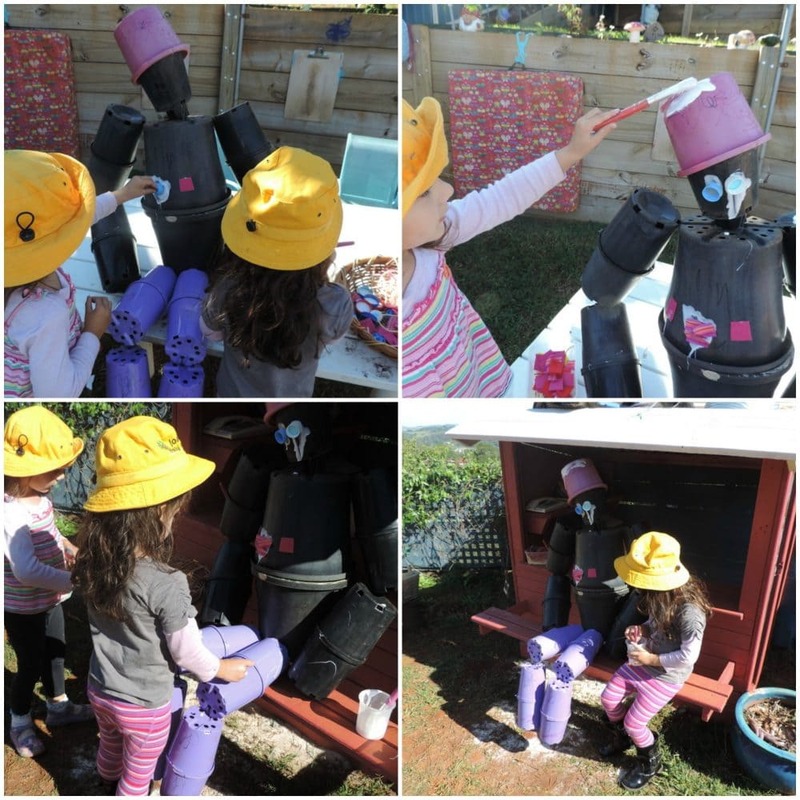 I’d love to see photos of your pot scarecrows so head over and share them in The Empowered Educator Community where you fill find dedicated early childhood educators from around the world sharing play based ideas and planning support. On Pinterest? Why not pin the image below so you always have it to come back to easily!